If you’re like me, sometimes it’s hard to find the balance in conversations with our relatives. While my intent is to have a casual conversation designed inspire and pique their interest in our shared history, I fear they equate me with a religious zealot trying to proselytize them. (I’m hoping my hairstylist doesn’t also feel this way; he said he was going to go home after my last appointment and sign up for Ancestry.com. I hope he was sincere and not trying to get me to shut up!) But I digress. Sharing our interest can be tricky, but it doesn’t have to be. 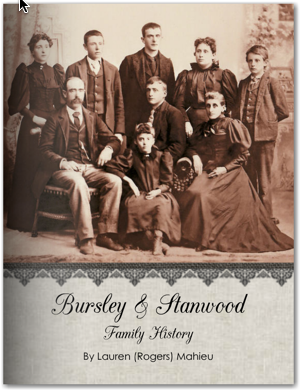 About two years ago I began working on the story of my ancestors, specifically Lavina Bursley and her husband, Albert Stanwood. I wanted to know who they were, not just where they lived and what they named their children. I wanted to share this information with my relatives, hoping to inspire them and not turn them off. 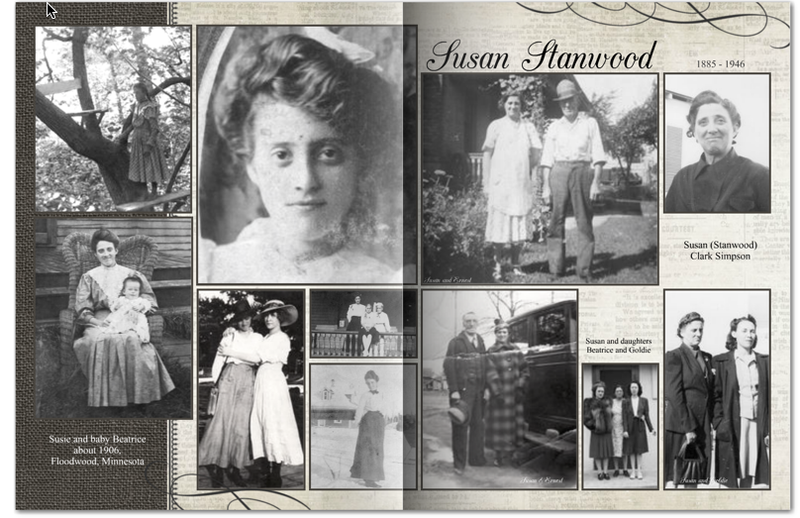 I was a little uncertain how to tackle the sharing part of the project, until visiting Lynn Palermo’s Armchair Genealogist blog, where she has several posts about using photo books to share family history stories. Photo books are great. The old saying that “a picture is worth a thousand words” is so true. Pictures draw the reader in. They get them interested. They don’t feel “preachy.” They make the viewer feel part of something bigger, part of a legacy. Pictures are powerful. Show pictures of the generations of women in our family, going back to Lavina (Bursley) Stanwood, our oldest, photographed female ancestor. Add enough modern day pictures and information to make the books interesting even to the non-genealogist, and hopefully get them to keep turning the pages to read about Albert and Lavina. Tell our family history in a story format, bringing in details that are interesting. I included visual items as much as possible, such as the homestead documents, newspaper clippings, letters, postcards, photographs, and other items that could replace text. Each book had a personalized banner showing photos of successive generation, beginning most recent on the left. Photos of Grandma Susie, my grandmother’s mother, appeared in each photo book. The goal, of course, is that some day these books will find their way to someone who has a genuine interest in genealogy and who may want to know where this information came from. So, in addition to the photos and other items, I wished to also include about 30 pages of text with end notes, and there really wasn’t a platform with any of the well-known vendors that was designed to create both simple photo books with themes as well as books heavy in text with citations. After checking around, I did find one publisher that worked, albeit with a little creativity: Mixbook. The good news? I have family members ASKING for books, interested in the history and wanting to know more! Mixbook allows a mix and match of themes. 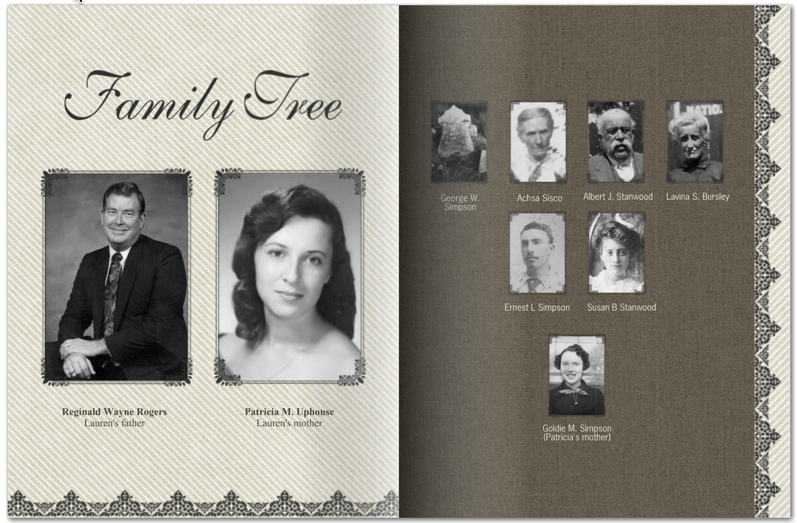 Mixbook has a family history theme already developed. Mixbook provides the freedom to design your own pages beginning with a blank page. 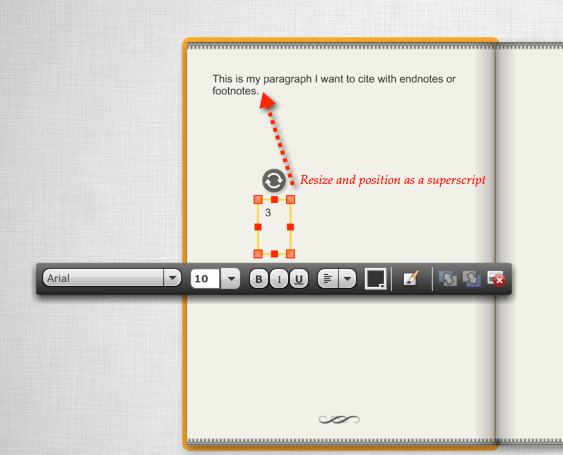 Mixbook has a great work-around for creating the superscript needed for footnotes and end notes. 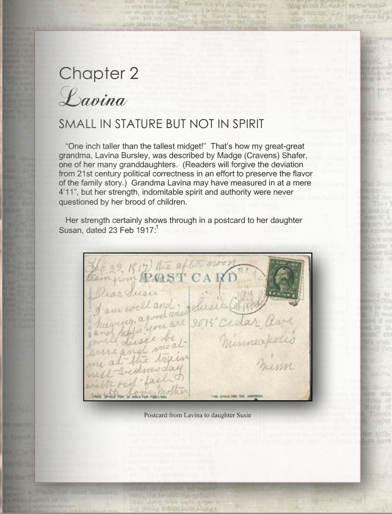 End notes were used as appropriate for the written history of great-great grandma Lavina’s life. Create a new text box, size the text, and slide into position to create superscript. 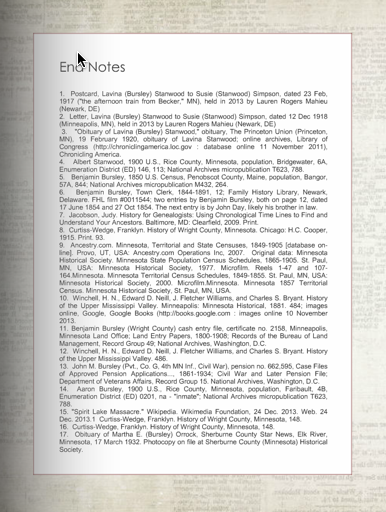 The end notes appeared at the end of the history; this seemed more palatable to non-genealogists than using footnotes. A page of the end notes contained in the book. This entry was posted on Sunday, December 28th, 2014 at 1:09 PM	and posted in Pictures, Technology. You can follow any responses to this entry through the RSS 2.0 feed. Lauren you book is wonderful! You have inspired me to get back to the one I am working in “Blurb” . . . Mixbook seems a bit easier to use than the one I have in Blurb. I haven’t been working on it because I find Blurb difficult but that just might be me . . . I may give Mixbook a try. I too feel books are the best way for sharing and passing on our family history . . . family members who have no interest become interested and it’s not so boring to them. It’s all in one place and visually appealing at the same time. Thank you for your great post . . . I can’t wait to get back to my book now! Thank you. I found Blurb to be a bit less user friendly, but had checked into it before deciding on Mixbook. Good luck with your project! Oh my Lauren! The book is a treasure. I made the leap to blogging a year ago. You’ve inspired me to consider a book also. Beautifully done. You’ll have to blog about your finished project when done! Good luck and enjoy the process! Thanks for the thorough rundown on creating a photo book from the ground up.